The Millennial generation, ages 18-34, constitute over 73 million Americans and roughly one-fifth of all global tourists, according to the United Nations. In truth, the Millennial generation is the largest since the Baby Boomers and, in the coming years, will have more of a deciding impact on, not only the travel industry, but the global economy. As it stands, Millennials generate over $180 billion in international tourism revenue on average, which is a pretty big chunk of change. So what do Millennials want out of their travel experiences? Studies, and the increase in travel revenue, shows that Millennials are more likely to travel, and travel often, than other generations. There's more of an emphasis on the importance of travel and what one can gain from seeing new places, meeting new people, and experiencing the world from a different point of view. There is more of an understanding in this generation that traveling can, and will, enlighten those who see the value of venturing out of comfort zones. Millennials have been found to enjoy a variety of lodgings, and not all hotels. Hostels, camping, roadside motels, and quaint inns are included along with room-share services like Airbnb. They are also more loyal to hotel chains with an increased number of Millennials signing up for hotel loyalty reward programs, to help with the budget of their extensive traveling. Millennials may be traveling more than any other generation right now but they are also spending less. There's less of an emphasis on luxury items, all-inclusive resorts, and high-priced itineraries. In exchange, they tend to enjoy traveling like locals, staying in lower priced lodgings and "getting lost" in their destination, steering clear of many of the set guide book recommended attractions. They tend to be more conscious of sticking to their set budgets and appreciate a good deal. This leads into everything else. As the biggest generation since the Baby Boomers, Millennials are starting trends left and right. Uber? Airbnb? Those were trends set by Millennials, and are now huge travel institutions. Marketing campaigns are seeing the importance of targeting this generation and have begun to change the way companies approach their customers, molding around what they think Millennials want. Like a ripple in a pond, Millennials have the power to spread their influence throughout the entire industry. Even though they're budget conscious, Millennials are also spontaneous and are often last-minute bookers for flights and hotels. This is not entirely recommended for the best deals when traveling but it does show more of a societal identity. Millennials are also more likely to turn a business trip into a vacation, staying longer or taking side trips. They're opportunists and with the world at their feet, why stay at home? Growing up in a media filled age with the news constantly spouting disaster, is it any wonder that Millennials are more environmentally conscious than the other generations? Millennials have seen, perhaps more than any other, the change in the environment and have had the benefit of decades of scientific study to prove so. As such, Millennials are more likely to take part in sustainable travel, ecotourism, and voluntourism than other generations. They're more likely to prefer trips into the wilderness (national parks, etc. ), to take only pictures and leave only footprints, and to be more conscious of their impact on the earth through their actions. This should come as no surprise but the "digital natives" have a knack for technology. Studies show that 97% of Millennial travelers will post on social media during their trip, at some point. They are also more likely to book their trips online or on their mobile devices. This is not to say that Millennials experience travel solely through their smart phones. On the contrary, they're more likely to be present in their trips, seek the value in their destination, and then post about it later. They do have a pretty strong social media game, however, and the travel industry has taken notice. 79% of Millennials have admitted to being more adventurous with trying new food and experiences while traveling. Getting out of comfort zones, seeking new experiences, and doing things you wouldn't normally do all help a person grow. Adventuring, whether you're trying sashimi for the first time or you're skydiving, allows you to see a different side of yourself and a different side of the world. Life is truly an adventure, if you only step out and see it for yourself. Finally, one of the most important habits of Millennials is that they prefer unique travel experiences. They are less likely to book pre-made vacations (i.e. trips with pre-set itineraries) and opt instead for personalized travel, set to their interests and schedule. 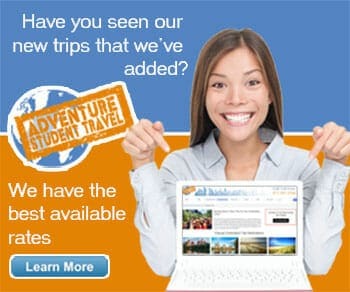 This is big for companies like Adventure Student Travel (psst...we love making custom trips! ), as this custom feature can help attain an entire generation of avid travelers who want to spend money on seeing the world, one trip at a time. If you're a traveler looking for someone to help you plan your next trip, give us a call and our expert team can help design a custom trip around your group's interests and budget. At Adventure Student Travel, it's all about you.